Chandigarh 31st January:- Hindustan Scouts and Guides organized a State level 5-Day Camp "Tritya Pad" at KBDAV-7, Chandigarh from 31st January 2017 till 4th February 2017. National Secretary, Hindustan Scouts and Guides, Ravinder Talwar unfurled the Flag and declared the 5 Days' Camp open. Other Hindustan Scouts and Guides dignitaries present on the occasion were Dr. Vinod Kumar, State Secretary, Hindustan Scouts and Guides and Maha Singh, National Treasurer, Hindustan Scouts and Guides. All the members of Hindustan Scouts and Guides were enthusiastically welcomed by the Scouts and Guides with Scouts Clap, a Salute and a left hand shake. Students sang Scouts Prayer followed by Scouts Pledge. On the first day of the camp, the National Trainer, Pushp Raj gave training to the students that included–First Aid, Camp Crafts and Pioneering, Scouts Rules etc. This is the third consecutive year, that the School has organized camp for the students. Chandigarh 31st January:- The day concluded with delightful items that were made in The Bakery and Pastry Competition, which was organized for the third year students of Dr. Ambedkar Institute of Hotel Management, under Ministry of Tourism, Government of India where Prince Khanna stood first. The students were judged by the eminent judges from the culinary milieu on variety of parameters such as artistry, presentation and the taste of their creations. Chef Ramandeep Baggga, Senior pastry Chef SukhVilas, Chandigarh and Chef Jaideep, pastry chef Taj, Chandigarh who tasted and judged all the items. They prepared bread loaf or bread rolls; one decorated cake of 1 kg and four different varieties of petit fours or pralines. Some of the exquisite bakery products prepared by the students were White Chocolate Mud Cake with Raspberry frosting Lemon strawberry swirl , Chocolate and Hazelnut Croustillant, Walnut and Coffee Gateaux ,Herb and Olive Foccacia, Miami soft rolls , Mint mayo wheels , Bermuda Triangle rolls , Lemon Tart , Spinach and Ricotta brochette. Bharti Tyagi, Principal of Institute said that such events help the students to showcase their talent, creativity and skills which they have acquired with their hard work and dedication during the years in the institute. She is very pleased with the performance and the results. She believes these students will shine and make their mark in competent professional world. 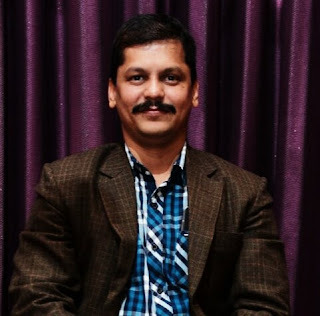 Chandigarh 31st January:- Dr Manish Rathi, Additional Professor in the department of Nephrology has been awarded 'Shurvir Singh Visiting Professorship' by the Association of Physicians of India (API). API is a large society of physicians of all over India. He was awarded this award during the recently held annual conference of API, APICON 2017 in Mumbai. This award was conferred to him in recognition of his work on Systemic lupus erythematosus-Lupus Nephritis. Lupus nephritis is an autoimmune condition that affects kidneys and if untreated can be fatal also. Dr Manish Rathi has large experience in treating this disease. His work has also been recognized by International Society of Nephrology and European Renal Association in the form of 'Best paper award'. Earlier he was also conferred 'Bansal oration' by the Indian Society of Nephrology for his work on lupus nephritis. Chandigarh 31st January:- Continuing its upward journey, the Indian telecom industry posted another month of growth by adding 8.18 million mobile subscribers in the mobile telephony market in December 2016. In the data released by COAI, the association of mobile telephony service providers in the country, the number of mobile phone subscribers grew to a total increase of 809.99 million in December. It is noteworthy here that from the month of August 2016, the net subscriber base has gone up from 2.09 million to 8.18 million in December. Director General, COAI, Rajan S Mathews said that growth of the telecom industry correlates with the overall growth in the country as telecommunication services are the backbone of the economy. Despite immense financial strain on the industry, the industry has still added the numbers in December 2016. These figures also represent the increasing footprint of the mobile industry and the number of lives touched by it in a positive manner. Amongst the telecom companies, Bharti Airtel continued to hold on to the pole position in December, adding another 2.50 million additional subscribers during the month to take its total subscriber base to 265.85 million mobile subscribers. Closely followed by Vodafone with 204.69 million subscribers and Idea Cellular with 190.52 million subscribers. With 32.82%, Bharti Airtel continues to own the maximum market share in the industry. The report, which also assesses the growth of mobile subscribers across various circles in India, said UP East added the maximum number of subscribers (74.90 million) in December and Idea added the maximum number of subscribers (2.83 million) in December. Rajan S Mathews further said that the continuous growth is a testament to the importance which the citizen accord to the mobile services which have today emerged as an essential part of our daily lives. It also goes on to show that the telecommunication industry which recently crossed the one billion mark in India, is a great story to tell and the Industry has much to celebrate as it continues to deepen reach and facilitate access for new users across the country. Chandigarh 31st January:- Mahindra & Mahindra Ltd., India's leading SUV manufacturer, today announced the introduction of a stylish new look for its compact SUV KUV100, as it completes one year on Indian roads. The more stylish KUV100 will be available in the K8 variant with two options for dual tone exterior color–Flamboyant Red or a Dazzling Silver body with Metallic Black roof. The SUV stance has been enhanced with larger sized 15" alloy wheels with a dynamic design. The interiors get a new sporty black and premium theme. In addition to this the K6 & K6+ variant will now be available with spider design 14" alloy wheels. In addition to this, customers get options to personalize their KUV100 with 4 accessory kits, namely sporty exterior and interior kits and premium exterior and interior kits. Each kit comprises of multiple accessories to further enhance the style quotient of the KUV100. Launched in January 2016, the KUV100 has made its presence felt in a very short time, having sold more than 42,000 units since launch. 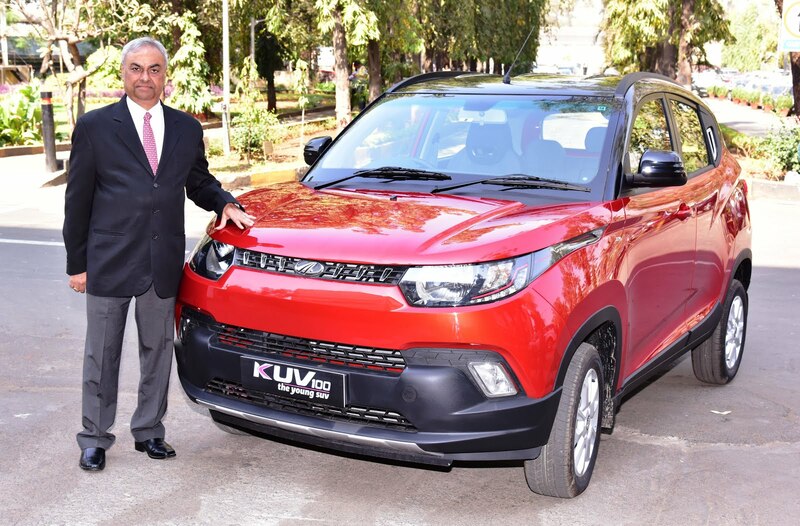 Speaking on the introduction of the fashionable new look KUV100, Pravin Shah, President & Chief Executive (Automotive), M&M Ltd., said that on the first anniversary of KUV100, we would like to thank our customers for their support in creating a new SUV segment. The KUV100 has the appeal of an SUV and the practicality of a compact car, making it a compelling value proposition. He said that at Mahindra, we constantly update our products in keeping with the latest trends. We have introduced the new avatar of the KUV100 with dual tone exterior colour, sporty and premium black interiors and bigger dynamic design alloys wheels along with various accessory kits. We are confident that it will further build on the KUV100's style quotient and make it a popular choice amongst the youth. The KUV100 price starts at 4.58 Lakh (Ex-showroom, Delhi) and its new avatar will be available on the top end K8 variant for Rs. 6.37 Lakh (Ex-showroom, Delhi), at a differential of Rs 13,000 only. Bookings are open at all Mahindra dealerships with immediate effect. Chandigarh 31st January:- After taking down the evil villain Gamosha, Sony SAB's Trideviyaan have another task at hand. This time the girl trio comprising of Dhanu (Aishwarya Sakhuja), Tanu (Samaira Rao) and Manu (Shalini Sahuta) have to retrieve a rare and precious diamond from England that is stolen by a thief in India. The police force lead by Shaurya (Anshul Trivedi) haves been assigned the responsibility of taking care of a very expensive Pink Diamond from England worth 600crores that is to be displayed at an art exhibition. Upon Dinanath's (Rituraj Singh) instructions, Trideviyaan are asked to assist Shaurya in keeping the diamond safe and take on disguises to enter the exhibition. To keep a close eye on the diamond, Manu becomes a Statue (Sonpari) which is displayed at the exhibition with Dhanu & Tanu disguised as its owner-Bade and Chote Miyyan respectively. The drama unfolds when the thief successfully robs the diamond and in haste hides the diamond inside a bun. Much to the dismay of the thief, Manu unknowingly feeds the same bun to a little dog that appears on the scene. Upon consumption of the bun, the dog becomes sick. Seeing the dog unwell, the girls take him to a vet where they realize that he has swallowed the diamond. In order to protect the diamond, Trideviyaan decide to take the dog to Chauhan house. However, the biggest challenge is to hide the dog from Garv (Winy Tripathi)) who is allergic to dogs. Commenting on the new track, Shalini Sahuta who plays Manu said that the latest track is very entertaining. Dhanu, Tanu and Manu decide to help Shaurya keep the diamond safe by disguising themselves. However, their efforts backfire when a dog swallows the diamond. The naughty dog proves to be a problem for them and hiding him from everyone is not only an effort but quite hilarious. Chandigarh 31st January:- Prof. Subhash Varma, Acting Director PGI honored Dr. Rajendra Prasad, Prof. & Head, Department of Biochemistry and ten officers and officials on their superannuation today by presenting mementoes to them. Amitabh Avasthi, DDA, Dr. Anil Kumar Gupta, Medical Superintendent, P.S Saini, Superintendent Hospital Engineering and Sushil Thakur, F.A. handed over beneficiary cheques comprising GPF, gratuity and group insurance. Respective heads of departments wished them well in life by presenting bouquets to them. Chandigarh 30th January:- We ought to serve our country and should always remember the great sacrifices by the great heroes & martyrs of the independence and should maintain peace & brotherhood among ourselves by following their footsteps. Only this will be a great tribute to them. This was stated by Deputy Commissioner D.S.Mangat while addressing the death anniversary function of Father of Nation Mahatma Gandhi at District Administrative Complex. During this he also paid homage to the father of nation in front of Mahatma Gandhi's picture and remembered other martyrs who sacrificed their lives for the nation. During this a two minutes of silence was observed as the remembrance of martyrs. 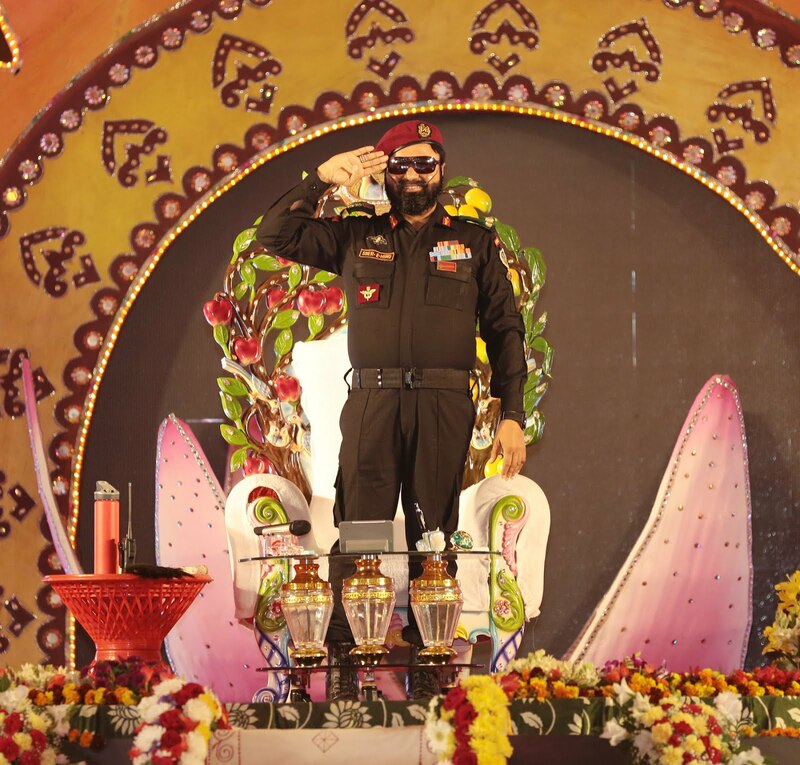 Earlier, a troop of Punjab Police guards paid homage to the martyrs by keeping down their weapons as a respect to the martyrs. During this Additional Deputy Commissioner Charandev Singh Mann, Assistant Commissioner (General) Jasveer Singh, Assistant Commissioner (Grievances) Dr. Nayan Bhullar along with other police officers and employees paid homage to the father of nation. 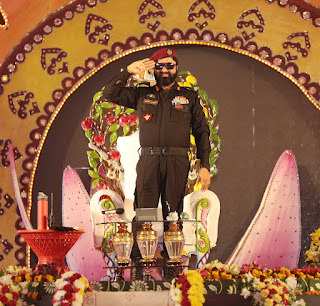 Chandigarh 30th January:- The annual function of Maharishi Dayanand Public School Daria, Chandigarh was held at Kalagram. It was inaugurated by Social worker Manpreet Kaur. The celebration started with jyoti prajvalan and chanting of Gaytri Vedic mahamantra 'Gaytri'. Mayor Asha Kumari Jaswal was the Chief Guest. She inspired the students and lauded the dedicated efforts being put in by the school and its staff in promoting the education in rural area. She said that education develops the human life. Those who know the value of time can easily achieve the goal. So every student should work hard to achieve the goal of life. Jaswant Rana, President of Chandigarh Press Club appreciated the achievements of the students in various activities while laying stress upon the importance of hard work for the development of the future career. Kids of pre-primary participated in the fancy dress show. They recited rhymes which attracted one and all. The Primary students performed folk dance. The students of middle and higher classes presented Bhangra, Gidda, Dandiya and Nati. Chandigarh 30th January:- To conserve water and save environment the students of Gian Jyoti Global School went to the streets of Mohali. They also showcased nukkar natak on the theme of Water Conservation and Save Environment. Various activities like poster making and competitions were also organized to spread awareness and to make the students more sensitive for their mother planet. Ranjeet Bedi, Principal, Gian Jyoti Global School while speaking on the occasion said that students have tried to spread awareness about water conservation through rally, poster making and slogan writing. Gianjyotians also planted sapling in and outside the school premises and took oath to be more sincere and devoted to keep the planet pollution free. Ranjeet Bedi further said to the students about the importance of the environment and the need to save it for future generations. She asked the students to protect environment. Chandigarh 30th January:- To give audiences a taste of the newly explored genre of Horror-Comedy, Naye India Ka Blockbuster Movie Channel - &pictures presents the Prabhu Deva starrer 'Tutak Tutak Tutiya' on Thursday,2nd February, 2017 at 8 PM. Directed by A. L. Vijay, the film also stars SonuSood and Tamannah in the lead roles. Talking about the movie, producer-actor, Sonu Sood said that his character in Tutak Tutak Tutiya is different from what he has been doing so far. He is used to doing action sequences but his character in this film was quite simple. Being a producer and actor at the same time is difficult but creatively satisfying. He has learnt a lot while working on the film. A perfect family entertainer Tutak Tutak Tutiya revolves around Krishna (Prabhu Deva), who wants to get married to a modern, open minded city girl. A visit to his paternal home in Tamil Nadu crushes his dream as he is forcibly married off to Devi (Tamannah). She is a naïve villager who does not match any of Krishna's parameters. Back in Mumbai, the newly married couple rent an apartment without realizing that it was previously leased by an aspiring actor Ruby who had committed suicide. Things take a hysterical turn when Krishna starts noticing the drastic personality changes in his wife who now in her uber-cool avatar addresses herself as 'Ruby'. Catching the fancy of the superstar Raj Khanna (SonuSood), Ruby finally gets a chance to fulfill her unfinished dream to star in a movie. 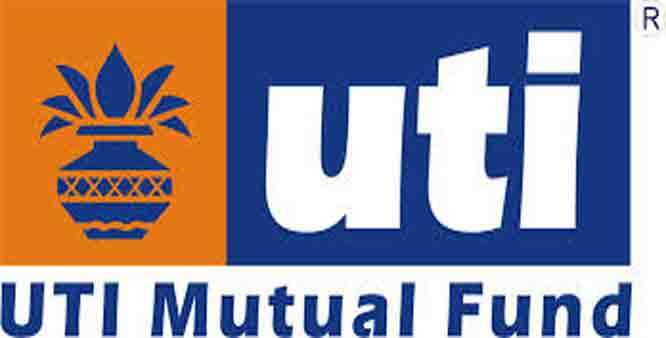 Chandigarh 30th January:- Vetri Subramaniam has joined UTI Asset Management Company Limited (UTI AMC) as the Group President & Head-Equity with effect from January 23, 2017. 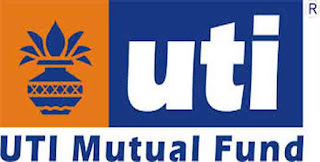 He has taken overall charge of Research and Fund Management of the equity schemes of UTI Mutual Fund aggregating to approx. Rs. 35000 crores. Vetri Subramaniam is an MBA from IIM, Bangalore and has been associated with Research and Fund Management for over two decades. He has worked with various Institutions like Invesco Asset Management, Kotak Mahindra Asset Management, Motilal Oswal Securities etc. On the occasion Vetri Subramaniam said that he is pleased to join an Institution which has traditionally dominated the Indian capital markets as a mutual fund and a financial development institution. UTI has a rich tradition in in Research and Fund Management, He looks forward to using his experience in this area to help the organization strengthen its capabilities in this domain and serve investors well.